OFTEN THERE IS a wide gap separating a concept from reality. Such is the case with California's high-speed rail project. Conceptually, fast, comfortable, fuel-efficient, intercity, passenger rail transportation makes a lot of sense as fuel prices rise and reductions in carbon dioxide emissions are mandated. However, there are a number of inconvenient realities that come between California's dream of high-speed rail service and actually constructing it. The latest roadblock is a court ruling that the High Speed Rail Authority's environmental impact report is "inadequate." The court's conclusion is hardly surprising considering that the EIR failed to address Union Pacific's decision not to allow the trains to run along its tracks from Gilroy to San Jose. When the high-speed rail project was first proposed, supporters assumed it would use the Union Pacific's tracks. Without Union Pacific's right of way, an alternate route would have to be considered, affecting the Monterey Highway or requiring the taking of additional private property. The ignorance here is astounding. UP's tracks were NEVER going to be used, at least not in any plans I've seen over the last two years. I can't speak for the CHSRA, but this HSR supporter never expected to use UP's ROW either. Ever since I became familiar with the situation in May 2008, I understood the plan was to use land next to UP's ROW, but not the ROW itself. Additional private property may have to be taken, but as southern Santa Clara County region is much less built up than the Peninsula, this should not require much if any loss of housing. As a result of the court's ruling, the rail project is likely to be considerably delayed as a new EIR is written and the additional time and costs of buying land or battling Union Pacific in court are considered. This is blind speculation almost entirely lacking in evidence. We have no indication what remedy the judge will order. A new EIR does not seem likely, and although it is a possibility, MNG has no basis whatsoever to assume it is a definite outcome. The time and cost of dealing with UP is certainly a consideration, but as I explained yesterday federal assistance can expedite this process. Alternate routes, such as one over the Altamont Pass, which some rail advocates favor, are even more costly and also would require a new EIR. Well, at least they got that one right. Altamont is dead. Will groups like the Planning and Conservation League finally accept that reality and devote their efforts to actually supporting HSR? Voters approved a $9.95 billion rail bond measure last November. The rest of the money is supposed to come from the federal government and investors. Delays can only increase the costs and discourage investors. But that is hardly the only problem with the high-speed rail project. The business plan is inadequate. There is no accurate estimate of ridership, fares, operational costs and investor interest. Also, the $40 billion cost estimate is dubious. I see MNG decided to rehash a bunch of the old discredited HSR denier nonsense for good measure. I suppose this means that once we've discredited this editorial we can expect its claims to keep reappearing in MNG editorials for years to come? With so many other greater capital project needs such as fixing the Delta, highway repair and school renovations that require large amounts of funding, California should sidetrack its highly questionable high-speed rail project. This is the new line of attack against HSR, and we heard it in Menlo Park last week: that HSR isn't worth the money given all the other priorities. The fact is we need to and can do all of these things. HSR is necessary to this state's future. To sacrifice it because we're too cheap to find money to pay for our other priorities would have been like refusing to build the Golden Gate Bridge during the Depression. That move, funded by local bonds issued in the depth of the Depression, worked out pretty damn well for California. So too will HSR. MNG will never admit it, and that's fine. We didn't need them in the campaign to pass Prop 1A, and we don't need them in the campaign to ensure that the will of the voters is respected and the HSR project built. "Our position continues to be the same as what we've said in the past," Union Pacific spokesman Tom Lange said from Omaha, Neb. "The high speeds of these trains is simply not compatible in our right of way. "We've had discussions with them, but the bottom line is that safety comes first and foremost." There's been a lot of discussion in the comments about whether running HSR trains on tracks near the UPRR tracks, but not in their ROW, would pose a safety hazard of any sort. Maybe it does, maybe it doesn't, but UPRR's position is clear, and with the recent ruling in Atherton v. CHSRA it's clear that the issue has to be revisited. So it is good to hear that UPRR and CHSRA are talking, but it is quite unclear what are the substance of the talks and whether or not there's any hope of forward momentum. Timing is critical — and that has some officials saying the railroad's stance is a negotiating ploy, partly because the line is lightly used. Currently, just 14 trains run each day between Gilroy and San Jose — six freight, six commuter and two Amtrak trains. On Oct. 2, the rail authority plans to submit its application for federal stimulus money. It needs approval of those funds soon to meet Washington's requirement that construction be under way by 2012. If the judge rules that the entire environmental study be revisited, "that could be the death knell for construction on the Peninsula," said high-speed board member Rod Diridon. "If it's a remedial action, we can deal with that." The recent ruling may also delay Caltrain's long-range plans to expand commuter service by converting its diesel trains to electric. This would enable the agency to speed up service and run more trains more quickly. It is relying heavily on stimulus cash to bankroll the $785 million initiative, $516 million of which is still unfunded. Some will surely quibble, as they have in recent comments, that this shows the flaws of Diridon's insistence on including the Peninsula corridor in the CHSRA application for federal HSR stimulus funds. Personally I think the CHSRA was right to be aggressive in pursuing these funds. But this does make clear that more than the old Altamont vs. Pacheco dispute is at stake here. Federal stimulus funds are necessary to get construction underway on the Peninsula - construction that, as Mike Scanlon pointed out Wednesday night, is vital to Caltrain's survival. As I have repeatedly predicted, the parties to this lawsuit have decided it is acceptable to risk the future of passenger rail in the Bay Area - including the HSR project and the very existence of Caltrain - to pick a fight over what is a comparatively small matter. True supporters of HSR would have accepted the Pacheco choice, worked to ensure it was built properly and with respect to the environment, rather than use that choice to try and blow up the whole project. Still, it is good to see that CHSRA and UPRR are trying to be sensible about this and are talking to each other about the matter. These discussions can take quite a long time - UPRR has been dragging its feet on selling the Davenport-Pajaro line to Santa Cruz County for over 5 years now. Tough negotiations with freight companies are nothing new. Twenty years ago, it took more than two years of talks before Caltrain agreed to buy the San Jose-to-San Francisco tracks from Southern Pacific for $242.3 million. Talks between the Valley Transportation Authority and Union Pacific dragged on for four years before the VTA agreed in 2002 to pay $80 million to run the BART-to-San Jose extension down the UP corridor between Fremont and San Jose. "We've negotiated with them on several acquisitions, and they are very difficult negotiators," VTA General Manager Michael Burns said. "They are a private company out to protect their interests. "But I will be very surprised if at the end they don't reach an agreement." This is why I believe a federal role is absolutely necessary to ensure these negotiations conclude quickly and fairly to all sides. Current federal law gives UPRR all the negotiating power, enabling a freight railroad whose operations often seem stuck in the middle of the 20th century to hold up the development of a modern 21st century passenger railroad network. President Barack Obama has made high speed rail a key part of his administration's vision for America's future. But so far he seems to have emphasized HSR funding over the other key policy aspects of implementing HSR. Now I'm not going to complain that Obama wants to change 60 years of federal transportation policy and finally direct some real funds to HSR. And yet that's not going to be enough to ensure HSR happens. While I recognize that it is not Obama's style to force or pressure anyone into doing anything, both the White House and the Congress - particularly California's two powerful US Senators - need to be examining ways to modernize US railroad policy and legislation. In particular they need to redress the balance of power between the freight railroads, which are essentially private contractors for the federal government and who owe their very existence to the federal government, and the state and local passenger rail systems that the federal government wishes to promote and expand. The best way to accomplish this would be to have Senator Feinstein or Senator Boxer help mediate these conversations, potentially alongside the Secretary of Transportation or even Vice-President "Amtrak Joe" Biden. They can encourage UPRR and CHSRA to quickly come to an agreement that satisfies both sides, while letting UPRR know that if they do not come to a quick agreement, then perhaps it would be time to change federal law to help provide entities like CHSRA a more level playing field - starting with eliminating the obsolete ban on states using eminent domain on federally-chartered railroads. That would require a greater level of leadership from California's federal representatives than we have yet seen on HSR. But it is now time for them to step up and prevent a signature project from falling into a morass. A Grand Bargain With UPRR? the recent Initial Ruling on Atherton v. CHSRA underscored yet again that lines on a map are not at all the same thing as deeds to rights of way. The judge essentially signaled that the level of risk of eminent domain takings needs to be quantified at the program level, i.e. factor into the choice of preferred route. In this particular case, the biggest red flag related to the UPRR Coast Corridor ROW between Santa Clara and Gilroy, especially the section south of way point "Lick". It lies roughly 3 miles south of San Jose Diridon, close to the intersection of Almaden Expressway and hwy 87. However, that isn't the only stretch of the planned network in which CHSRA will have to contend with UPRR - far from it, in fact. As we discussed on this blog back in March, 50% of the entire HSR network as planned today relies on acquiring part of a UPRR right of way or else land very close to it. Where possible, the expensive grade separations required for HSR should include adjacent legacy tracks to maximize bang per taxpayer buck. In the discussion thread on the Initial Ruling On Atherton v. CHSRA, regular commenter Tony D. in San Jose(?) Gilroy claimed that "Freight service in this corridor and traffic on Monterey Hwy is nil." While that's no doubt an overstatement, it does highlight the fact that the coast corridor isn't actually all that busy north of San Luis Obispo. Its primary value is as as a backup freight route in case UPRR's core route via Cajon Pass and the Tehachapis were to become unavailable for trains heading up the west coast or across to Salt Lake City, e.g. after an earthquake. Since UPRR is a for-profit enterprise, Tony surmised "that [it] will either operate or co-operate [with] high-speed rail in California. They're not blind to the profits HSR systems are making overseas [...]. I don't think this would be a bad arrangement." To which another regular, SF native and Amtrak employee Jim, replied: "Well they can't just operate it, they have to bid on it first and prove that they can provide the service infrastructure (staff, ticketing systems, the list goes on per the requirements an operator must offer) and UP doesn't have any such thing or people to do the job. [CHSRA] wants someone who can bring experience, personnel and the other infrastructure needed for passenger travel. That means Amtrak, an airline or a foreign railway." Now, I don't work for UPRR nor do I have any shares in the company or any other affiliation to it. I have no inside knowledge regarding where the company's head is really at relative to California HSR right now. Publicly, the company still maintains that HSR trains running next to its own would be a safety hazard. Simple passing of an aerodynamically contoured high speed train has already been shown not to present a showstopper problem even for extra-tall AAR plate H cars loaded with two empty containers. Lateral sway at the top of the upper container reached a maximum at a relative speed of 110mph and declined beyond that. The amount of sway obviously depends on the track centerline distance as well, which in the California system could be larger than the usual 15' or so (if the ROW is wide enough). The root cause of the cited safety concerns may therefore be the quality of UPRR's track and rolling stock maintenance program. The income generated by hosting HSR would go a long way toward addressing any deficiencies on that score. Derailment detection and automatic train protection systems would further reduce the risk of a freight train ever fouling an adjacent track and also triggering a follow-on collision. So, the noises UPRR is making could be either a signal that UPRR isn't really interested in avoiding derailments or, a negotiating ploy to jack up the price. However, for the sake of argument, let's pretend that Tony is correct and that UPRR secretly would be interested in getting back into the intercity passenger rail business, if only it were sufficiently profitable. The experience in other countries has shown that true bullet trains can and do turn operating profits, i.e. enough to pay for running the trains, maintaining the system, insurance fees and future expansion beyond the starter line. What they cannot do is turn a total profit, i.e. service the debt on the initial capital investment as well. That difference, combined with property tax laws, is why US railroads are not voluntarily building HSR systems on their own nickel. DesertXPress is the exception that proves the rule: it would be a loss leader for getting punters/tourists/convention attendees from (Southern) California to Lost Wages and back again. HSR opponents often cite this inability of passenger rail to fully fund its own infrastructure as evidence that it is a bad idea per se. As this blog has often pointed out, they conveniently forget the financial, energy security, environmental and social costs shouldered by taxpayers when they agree to invest in new highway lane-miles and airport runways. Fortunately, California voters showed in November 2008 they understand that moving people - as opposed to freight - just isn't a profitable enterprise in its own right. It takes public investment to reap the macroeconomic benefits of high speed rail, which in the California system will include traveling on renewable electricity instead of distilled dino-juice. Funding is supposed to come from federal, state and local governments plus private investors. The ~$33 billion estimate for the starter line reflects the cost of planning, land purchases, engineering, constructing the line plus yards and maintenance facilities, buying a fleet of trains and developing the human resources needed for safe and cost-effective operations. In its 2008 Business Plan (PDF p23), CHSRA estimated the cost of acquiring the ROW for the starter line at 7% of the the total, i.e. roughly $2.3 billion. This assumed that required land already in public hands (Caltrain, SCRRA, Caltrans etc.) would be made available at no cost. However, since UPRR is an interstate freight railroad that ostensibly delivers a public service so valuable Congress even delegated limited powers of eminent domain to it, the chances of successfully exercising eminent domain against UPRR itself are slim to none. That means the company has CHSRA over a barrel and can more or less name its price. The initial ruling in Atherton v. CHSRA has now strengthened its hand even further. The operations of the California HSR are supposed to be put out to tender via long-term contracts, separately for the infrastructure (a local monopoly) and the trains (competition possible). The idea was that these tenders will be entirely divorced from the process of acquiring land and getting the infrastructure built. However, there's more than one way to skin a cat. As we explored in the post on HiSpeed Services And Branding, there is always the option of bartering for ROW rather than paying for it up front. Any railroad that owns a ROW that CHSRA would like a slice of could negotiate for the initial contract to operate the HSR infrastructure and/or for easements such as deeply discounted slots on the timetable or blocks of seats on trains to be operated by someone else. One-off asset sales generate cash, but railroad operators are in the business of running trains. Participating in the operations of the HSR system could therefore be an attractive proposition for them. If CHSRA could somehow strike a statewide "Grand Bargain" barter deal with UPRR, that would solve most of its ROW issues at a stroke. It would also allow the Authority to claim UPRR as a private investor-in-kind. After all, a dollar you don't need to spend is almost as good as one you raise from financial institutions. Some lateral thinking could go a long way here. Whether this would be a genuine bargain for taxpayers or a Faustian one obviously depends on the fine print, of which there would no doubt be copious amounts. Giving up on the opportunity to put the initial operations contracts out to open tender, reducing its scope and/or saddling it with easements would be no small matter. Negotiators would also need to put a dollar figure on the value of grade separations plus fences plus CCTV surveillance of the entire ROW width, including all legacy freight/passenger tracks, to a freight operator. Cameras and software could conceivably even detect a derailed bogie on a freight car before that train's crew does. The wireless signaling and train control infrastructure of the HSR network could be leveraged to implement interoperable PTC functionality on the heavy freight tracks at sharply lower incremental cost. If all traffic on the entire ROW is controlled by a single infrastructure operator, the accident liability issue should become much more tractable. Add to that the potential for light rail freight, i.e. driverless High Speed Cargo trainsets coupled to passenger trains during the day plus a limited number of much slower cargosprinter or intermodal trains at night. Such trains would need to negotiate the 3.5% gradients in mountain crossings. To avoid excessive track maintenance overheads, the axle load on HSR tracks is strictly limited, typically to 17 metric tonnes, including the power cars/locomotives. That's only possible with non-compliant equipment, so light freight trains would be restricted to the isolated HSR network augmented with spurs to transshipment facilities in selected locations. The business model would be focused on getting high value goods shipped quickly and trucks off the roads. In technical, regulatory and business model respects, light freight would be entirely divorced from conventional heavy freight rail. In the simplest scenario, UPRR could limit its involvement with HSR to operating and maintaining the infrastructure according to timetables negotiated with the train operator(s). However, the company could go one step further and negotiate to also operate some or even all of the trains wholesale, by which I mean it would employ the drivers and maintain the rolling stock. Dealing with HSR and light freight equipment would involve a learning curve, but there would be plenty of time to build up a new business unit with a skilled workforce, headed up by managers poached from foreign railways that already have plenty of HSR experience. Keep in mind that UPRR has been in business for 147 years and that during most of that time, its progenitors did operate passenger trains. Companies can and do change their business models all the time, just look at how Apple Computer now makes cell phones and sells music online. The retail end of high speed passenger trains, i.e. marketing, selling tickets, cabin service and cleaning, could be left to organizations that already have relevant expertise in the state: heavy rail transit operators (Amtrak California, Caltrain, Metrolink et al. ), perhaps airlines already plying the California Corridor. Some of these might prefer to own their trainsets, others could charter them from UPRR in whatever livery they want. Similarly, UPRR might be content with just running the trains for established logistics players like FedEx, UPS etc. and not handle individual cargo items. On the other hand, retailing intermodal freight and cargosprinter service might well be something UPRR would want to do itself. 1) Needless to say, the bigger the bite of the HSR cherry UPRR would get without having to bid for it in open tender, the more value that would represent. At some point, it would exceed the total represented by the ROW offered. Conceivably, UPRR might even have to throw in track construction services, even cash, to get the deal it wants. That's fine, every dollar of private investment, in kind or regular, would let CHSRA stretch taxpayer dollars (both state and federal) that much further. 2) As part of any Grand Bargain, UPRR would formally transfer the ROW (land or underground/air rights) for the HSR tracks to a new entity owned by the state of California, possibly others as well. UPRR would not have a stake in this entity. This arrangement would let it avoid a massive hike on its property taxes while ensuring the new entity will be able to put the follow-on operations contracts out to a genuinely open tender some (large) number of years later. 3) Since infrastructure operations and maintenance and possibly train maintenance will be natural monopolies, the rates UPRR would be permitted to charge for these services would have to be spelled out in the Grand Bargain contract and regulated thereafter to prevent gouging. A cap on fee income would give UPRR an incentive to participate in track construction to make sure it's done right. The company does not yet have the specialized expertise required to actually design and build the track and overhead catenary geometry for a safe HSR system, that's where experienced foreign engineering consultants come in. UPRR would contribute its expertise in general track construction plus material logistics and some brawn plus supervisors on site. The idea is to let them learn on the job so they can maintain the high-tech infrastructure after it's built. 4) BNSF might be interested in a similar Grand Bargain in the Central Valley, perhaps even on its Trancon line out of the LA basin. HSR infrastructure operations are a natural local monopoly, with appropriate care it's perfectly possible to hand over control to another operator at well-defined interface locations. Air traffic controllers do it all time. 5) All of the above fun and game are moot if neither UPRR nor BNSF are interested in participating in HSR operations in any way. That is their prerogative, of course. First off, it was a pleasure to meet so many of you in person last night at the Menlo Park town hall event. For those of you who were there and who I didn't get to talk to, my apologies, I'm sure we'll reconnect at the Palo Alto HSR "teach-in" on September 12. I even got to say hello to Morris Brown and Martin Engel, and they were cordial and friendly to me as I was to them. It's not about personal attacks to me - I think they're wrong on pretty much everything to do with HSR, but that doesn't make them bad people. I also don't know how I would have gotten through the whole meeting without being able to let off steam by making snarky comments about stupid questions to Bianca, especially since my iPhone died with about 20 minutes left in the evening (if you were following the twitter feed and noticed that the tweets didn't go to 9pm, that's why. Don't worry, you didn't miss anything important). Overall Anna Eshoo deserves credit for hosting this event, and for bringing together folks from Caltrain and the CHSRA to talk about the high speed rail plans. Eshoo ran a good event - folks submitted questions or comments on cards, and Eshoo worked her way through an impressive amount of the hundreds of cards submitted. She promises that either her staff, Caltrain or the CHSRA will respond to each and every card that didn't get answered in person. Eshoo also did a good job of pushing the panelists to answer the questions that were asked as directly as possible. That was necessary to help build some trust between the audience and the panel, although as I'll explain, that was an uphill battle from the start, as many in the audience had already made up their minds about the CHSRA. Unfortunately, Eshoo's skills as a moderator did not outweigh her overall lack of familiarity with the project. Eshoo is a Menlo Park homeowner who lives very close to the tracks - "few people live closer to the tracks than I do," she explained several times during the evening. At times her perspective seemed to be that of a typical local - she said "I want less noise, I don't want a 40 foot wall, I don't want to lose my home." Of course, she should have known that there would be less noise, that a 40-foot wall was highly unlikely, and that she wouldn't lose her home. Caltrain and CHSRA officials made those points repeatedly during the night, but I am not quite sure Eshoo understood those points. I get the sense Eshoo called this meeting in response to numerous constituent complaints about the project, because Eshoo did not show she really understood the HSR project in any detail. One of the evening's most stunning moments came when she realized that the CHSRA already made the decision about the route for the trains before Prop 1A was approved. Eshoo seemed to have it in her head that the whole route itself was still up for grabs, and not just the details of its implementation. Further, she seemed to be dismayed that Prop 1A included a detailed routing based on the Final statewide EIR. Which is equally stunning to me. Did she expect people to vote for vaporware? To give $9 billion to a project that had no details nailed down? Eshoo's apparent surprise that a route had been selected before Prop 1A went to voters, and her claims that she didn't know about it, really do not make her look very good. As a sitting Congresswoman she should have known these things. The route debate got widespread media coverage last year, including on the Peninsula. For her to miss that rather key detail suggests she wasn't really paying close attention to what goes on in her district. Washington, D.C. - Representative Zoe Lofgren (D-San Jose), joined with Representatives Anna Eshoo (D-Palo Alto), Sam Farr (D-Monterey), Mike Honda (D-Campbell), and Tom Lantos (D-San Mateo) in signing a letter strongly endorsing the Pacheco Pass route for California's High Speed Rail Project. We are writing to express our strong support of California's High Speed Rail Project. We believe that the project will transform the state's transportation network into a much safer system that will serve our growing population for this century and the next in a way that can boost our economy while protecting our environment. We recently reviewed the Northern Mountain Crossing Corridor Study you released concerning different possible routes from the Bay Area to the Central Valley. We all agree that the High Speed Train network should serve all three major cities: San Francisco, Oakland, and San Jose. However, upon reviewing the document it is clear that the Pacheco Pass alternative provides a better level of service with a greater number of trains stopping in San Francisco, Oakland and San Jose on a daily basis. The Pacheco Pass route is also the least damaging to our region's natural resources. In order to connect the Bay Area to the Central Valley using an alternative option, the Altamont Pass, would require building a new high level bridge over the San Francisco Bay. The Altamont Pass option would also require construction through the Don Edwards Wildlife Refuge with additional impacts on the San Francisco Bay and Palo Alto shore of the Bay. This alone is a good enough reason in our opinion to reject the Altamont Pass outright. The impact the Altamont Pass would have on the environment could well make us rethink our support of any federal funding for the project. We believe there is sufficient and compelling data to determine that the Pacheco Pass is the best option for the High Speed Train to serve the Bay Area. We thank you for your consideration and will continue to follow the issue closely. So I don't know what Eshoo is talking about when she expressed surprise about the routing choices. True, Eshoo did not come off last night as a pro-Altamont person. Instead she came off as someone who really didn't understand some of the key project details. I hope she had some private meetings with Caltrain and CHSRA staff before the town hall, and that the town hall wasn't her first encounter with some of these issues. Eshoo did have some other very good points, including the need for the CHSRA to improve its outreach. But if I'm a Peninsula resident, I'd be somewhat annoyed and troubled that my Congressional rep gave off an impression that she hadn't been paying attention to the details 10-year long development of a project that would bring significant change (for the better) to my region. Two of the panelists were Caltrain staff - executive director Mike Scanlon and project advisor Bob Doty. Both of them were very, very impressive. Scanlon showed he clearly understands the need for the project as well as the locals' concerns. He emphasized that this is about survival for Caltrain, and that without electrification, Caltrain may not be able to continue operations. Caltrain needs partners to do the electrification, which will dramatically cut their costs. The state of California is no longer able to be that partner. So Caltrain needs CHSRA and its federal funding. I don't quite think the Peninsula NIMBYs understood this point (and they would probably refuse to accept it even if they did). Their vehement opposition to the HSR project could well destroy Caltrain. These towns are already choked with traffic as it is, including Menlo Park. They desperately need Caltrain to not only stay, but to improve. Bob Doty was another very impressive speaker. He has project management experience on HSR projects around the world, from the Channel Tunnel to Korea. Like Scanlon he was able to give quick and direct answers to questions, connecting with the audience even when the audience didn't want to hear what he had to say. Doty reminded the audience that tunneling is an extremely complex and difficult undertaking, that the decision to do it is not nearly as simply as the NIMBYs have made it out to be. Bob Doty is already working for the CHSRA. He reports 50% to Mike Scanlon (Caltrain) and 50% to Mehdi Morshed (HSR), in a dual-reporting arrangement initiated by the MOU between the two agencies. Mehdi Morshed and Dominic Spaethling represented the CHSRA. Spaethling didn't get many occasions to add comments, though he did a good job of explaining the upcoming public interaction process. Morshed was on the hot seat most of the night. His performance was mixed. It's worth keeping in mind that Morshed is not a public speaker by training - he's a project engineer. Morshed acknowledged that he's been getting some help on public outreach, and he did his best to answer questions directly. Most of the time he did this well, even if his more determined opponents in the audience refused to accept his answers. One example is a question a self-described Palo Alto NIMBY asked about the business plan. This question was highly misleading and was a clear attempt to sow disinformation. She asked whether the CHSRA was hiring a PR consultant to write the new business plan. Her implication was that the business plan would be a dishonest product full of spin and devoid of fact. But as Morshed explained, that's not actually the case. The Authority is hiring a PR firm to design the final publication of the business plan - the typesetting, the pictures, the printing. NONE of the content will be produced by the PR team - that comes from the financial and project contractors who rightly have the skills and knowledge to produce that information. It's not at all unusual for that arrangement to exist, whether it's a private or a public sector business plan in question. You want someone who knows PR to ensure that the plan is readable. The only reason anyone would make an issue out of this is if you wanted to undermine the public's confidence in the CHSRA. Morshed did less well when asked about the tunnel. He tried to reassure people that it would be given a fair hearing, but he may have gone too far in that by saying that tunnel costs "would be the last thing considered" when looking at a tunnel. Obviously it needs to be as much a factor in the choice as anything else - the CHSRA needs to ensure that it is going to build a cost-effective system. I understand Morshed's dilemma here, but the CHSRA needs to make it clear to Peninsula residents that unless they are planning to pay for the tunnel themselves, it is not appropriate for the CHSRA to be reckless with public funds. Overall, I don't think the town hall changed any minds. These things rarely do. Especially when there is a loud group of people who have already decided to believe that numerous myths are actually facts - and that if you point out that they aren't facts, the person who believed it will become indignant at the person doing the debunking. In that way the HSR debate resembles the health care debate in many ways. Just as "death panels" and "socialized medicine" started to dominate the conversation around health care despite there not being any evidence to support those claims, we now have arguments about a "Berlin Wall" and people convinced that numerous houses will be lost even though a cursory glance at the ROW shows that takings will be very, very, very few in number (especially in the Atherton-Menlo Park-Palo Alto area). What the town hall also showed is how difficult it has become to focus on the big picture. To their credit, Eshoo and Scanlon both pointed to the need for sustainable mass transportation, and Scanlon in particular understood that the 20th century model of transportation, relying on freeways, was no longer viable. The Peninsula was built on the railroad. It's time to give that railroad an upgrade. The Peninsula needs political leadership that is determined to build HSR, and determined to build it right. My question of the night was oriented toward that very matter. I wanted to hear that those in attendance, Eshoo in particular, would see to it that critics of the HSR project would not be allowed to overturn the will of the voters, that HSR would be built in a way that was cost effective. Eshoo took issue with my claims about "HSR critics" and said that everyone in the room wanted HSR built, the question was instead about whether or not it should happen. I don't think that is accurate. Judging from the questions Eshoo herself read, there were a lot of people who still questioned the basic premise of HSR. A clear statement that "this WILL be built and it will be built the right way" would have gone a long way toward pushing everyone toward constructive solutions. Instead I'll have to be content with Eshoo's claim that there are no HSR opponents. I'm going to hold her and the Peninsula to that claim. You too, Morris! As I wait here in Menlo Park for the HSR town hall to get underway, we have a ruling in the frivolous lawsuit Menlo Park, Atherton, and the PCL filed against the CHSRA. It's a mixed bag for everyone - the judge ruled that most of the Federal EIR on the Pacheco alignment was sound and that most of the petitioners' claims about it were "without merit." 1. EIR claim that vibration from tracks can be mitigated to a "less than significant level" is "not supported by substantial evidence"
3. EIR needed to have been "recirculated" based on Union Pacific's refusal to share ROW in the San Jose-Gilroy corridor area. The outcome is that the "writ of mandate" the petitioners sought is granted. In practice this is likely to mean the EIR will have to be revisited to consider the three points above. Other points that the court rejected, including the argument that US-101 and I-280 needed to be considered, or that Altamont itself needs to be reconsidered, do not appear to be reopened by this ruling. On Wednesday, August 26th, Rep. Anna G. Eshoo will host a Town Hall Meeting to discuss High Speed Rail. Experts from the High Speed Rail Authority and Caltrain will make presentations and answer questions. In November, 2008, Californians passed Proposition 1A, the Safe, Reliable High-Speed Passenger Train Bond Act for the 21st Century. How this will impact local communities has been the subject of considerable debate. The meeting will be held at the Menlo Park City Council Chambers from 7:00 p.m. to 8:30 p.m. The location is wheelchair accessible and parking is available. For more information, constituents can visit Rep. Eshoo’s website at http://eshoo.house.gov or call her District Office at (650) 323-2984 or (408) 245-2339. I'll also be providing updates via this blog's twitter feed @cahsr. $400 million of the application sent Monday would go toward a “box” to be built 100 feet below the redeveloped Transbay Terminal that would contain a future station for high-speed rail and Caltrain service connecting San Jose and San Francisco. Proposals for spending the remaining $700 million are scattered around the state for various intercity rail projects, Diridon said. Note that this is just for one specific, narrowly-focused pot of HSR stimulus - applications for another pot of money with more flexibility what qualifies for funds are due in October. Diridon still believes CHSRA, through the state of California and Caltrans in particular, should apply for $4 to $6 billion in that Phase II round of requests. It is highly likely that CA will get its $1.1 billion request, and we are still in a very good position to get some of the larger request that will be made in October and decided in early 2010. One of the biggest problem with building a high speed rail system in the United States, is all the unknowns. That's why we get highly questionable, back of the envelop guess work done by Harvard's Ed Glaeser. Spread the wealth around, and it's just going to look like more of the same. Were it not for the Congressional politics of funding anything - where people want to ensure their states and districts get a little something - I'd call this not only a very good idea, but a politically sensible approach. Congress and the Obama Administration ought to split the difference and help seed other HSR projects, even if they're not true bullet trains - but ensure that our flagship project here in CA gets the money it needs to be built and built the right way. Atrios makes this point as well. Robert J. Samuelson is one of the more right-wing writers at the Washington Post. His previous columns have proposed privatizing Medicare, for example, just to give you a picture of who we are dealing with. And like Ed Glaeser and Ed Morris before him, he has decided to bring a right-wing frame to his attack on high speed rail in today's Washington Post. Okay, I pulled the numbers from the US Census site (linked above.) Note these are numbers based on the year 2000, so current numbers are likely higher. average: 2,138 persons per square mile over nine counties served by HSR. This is just for the San Francisco to Irvine section, but I think we can safely lay density to rest as an argument. It is true that the Central Valley cities have smaller densities. But one of the purposes of HSR is to spur that density by providing HSR stations in city centers that can serve as magnets for transit-oriented development. Even with that in mind, the average density of the CAHSR route from SF to Anaheim is significantly higher than the numbers Samuelson provides. It blows his entire argument out of the water. That last chart in particular is of immense value in discussing American HSR plans. 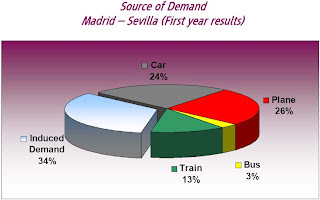 Spain was not the stereotypical European nation that already had a large share of its population using trains. 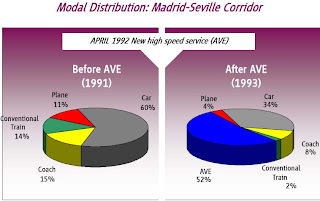 Spain, like California, was primarily dependent on cars and planes to get around the nation. And yet it is Spain that has had the most dramatic success with HSR in the last 20 years. Samuelson also made another point above, that trains don't work as well as cars because they don't give you door to door service. There are two flaws with this. First, a high speed train from SF to LA is still faster than driving, getting you from point A to point B in about half the time. Sure, you have to drive to a train station, but the HSR stations in both the Bay Area and SoCal will be centrally located. That leads to the next point that Samuelson almost totally ignores. Yes, as he says, beyond 400 or 500 miles high speed trains don't compete well with planes. 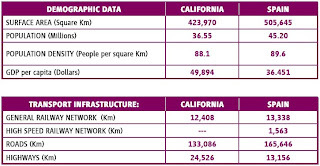 But most US HSR plans, including California's, fall into the sweet spot. SF to LA via HSR will be a 432-mile journey. Madrid to Barcelona is about 385 miles. And that corridor, once the world's busiest air corridor, high speed trains have had a smashing success, grabbing 40% of the market share in just its first year of operation. It should be quite clear that Samuelson's attack on HSR is not based on evidence at all. Rather, as Dean Baker points out, it seems based solely on hatred of trains. Weak stuff indeed. Finally, as Rafael noted in the comments to yesterday's post, it's a shame we're even having these discussions. California voters have made their decision - they want high speed trains. President Obama ran on a winning platform that included frequent and prominent references to high speed trains. Glaeser, Morris, O'Toole and Samuelson seem interested in using their prominent media platforms to try and reverse these outcomes. Yet they cannot do so on the evidence alone. They either have to structure their analysis in such a way that ignores the whole context and leaves a lot out, as Glaeser and Morris have done, or they have to ignore evidence entirely, as O'Toole and Samuelson have done. One wonders when the NYT and WaPo will be publishing pro-HSR op-eds in their pages and on their blogs. CBS's venerable Sunday Morning program took an in-depth look at California high speed rail today. The link takes you to the main online article, which is something of a transcript of the video segment. They include a background on earlier CBS News reports on high speed rail, from Walter Cronkite riding the Shinkansen in the 1960s to Charles Osgood on the TGV in 1990. Quentin Kopp gets face time, as does Phil Angelides. Overall it's very much a pro-HSR piece, with only one HSR critic getting just a tiny bit of screen time. Until the video of their HSR segment is available, content yourselves with another excellent Sunday morning video. Addendum from Rafael: Here's the video of the CBS Sunday Morning story. just a quick reminder for SF peninsula residents who may not be aware of this yet: Palo Alto is hosting a public workshop on HSR implementation in the SF peninsula on behalf of the Peninsula Cities Consortium. This body also includes Menlo Park, Atherton, San Mateo and Belmont. • What are the myths and realities about the Peninsula project? • What are best practices from around the world? • What have other cities experienced during construction of a major railroad in an urban setting? • Why can’t it be tunneled all the way? • What impact will eminent domain have on backyards and grade crossings? Parking: underneath City Hall and at Ramona between Hamilton and University. Addendum: Independently, CHSRA will be hosting a regular project-level scoping workshop for University City in San Diego county. The format of the meeting will be a workshop or fair, with displays, staff on hand to answer questions, and handouts, but no scheduled presentations. From 3 p.m. - 5 p.m. the meeting will be tailored to public agencies, and from 5 p.m. - 7 p.m. the meeting will be tailored to members of the public, although anyone can come and go at any time. Eric Morris closes HSR series by referring readers to Randal O'Toole. You know, in case you thought he and Glaeser were aiming for an honest critique. Certainly neither Glaeser nor I pretend to have the last word on this topic. We are looking to start some debate, not finish it. So if you want to learn more on the pros of true HSR, check out the California High-Speed Rail Authority’s site, or this report for the views of an articulate critic, the Cato Institute’s Randall O’Toole. Either Morris is joking or is even more in the tank against HSR than we ever thought. Randall O'Toole as a credible source on passenger trains?!?! This is the same guy who thinks riding a train is more harmful than driving an SUV and whose difficulties with facts and evidence has been well documented. I have extensive experience planning, designing, constructing, financing, and operating HSR networks; these have spanned the nation and have been terrifically elegant, with state-of-the-art locomotive technology and thousands of miles of flat, straight track to keep speeds high. However, those HSR systems were built from electricity, not steel. And while the HSR currently being proposed will cost tens of billions, the cost of my HSR network was comparatively modest: perhaps $30 in fixed costs for the purchase of the computer game Sid Meier’s Railroad Tycoon, plus negligible variable costs for the power to run my computer and depreciation on my mouse button. The sum total of the utility I experienced from this kind of HSR paid for those costs many times over. That's like saying I can run a street gang because I played Grand Theft Auto: San Andreas. How ridiculous do economics bloggers for the NYT not named Paul Krugman have to get before we stop taking them seriously? Costs in the real world are quite different. HSR is an exciting idea, and if we could make it appear by magic wand it’d be a terrific addition to our transportation network. But everything has a price, and the way things currently stand, the projected costs look like they outweigh the benefits. If the thought of some ominous budget numbers lurking on a piece of paper in far-off Washington doesn’t move you, consider the opportunity costs of this spending, in terms of health care, education, the economy, defense, or a (more effective) method of slowing global warming. Or if you want to keep the money in the realm of transportation, it could go to address what I consider to be the more serious problem we are facing: moving people around within our cities, not between them. There are innumerable flaws with this analysis, which is actually the heart of Morris's post. Morris claims to speak of opportunity cost, but where is the estimate of how much it will take to expand roads and airports in California to handle the passenger loads that HSR will handle? Estimates for that range from $80 billion to $160 billion. But nobody aside from Morris Brown thinks California HSR will approach even the lower range of that estimate. Morris appears to think that air travel will continue to remain cheap, plentiful and affordable. A kind of perpetual 2007. Last year we talked quite a bit about the airline crisis - how rising oil prices have jeopardized the easy air travel that we have come to expect here in the US. Airports in smaller cities have begun bribing airlines to maintain service, and cities like Fresno and Bakersfield have struggled to maintain the airline service they still have. For Morris to basically ignore the problems of the airlines he has to ignore the all-important question of whether oil prices will remain at the same price they're at now. There is ample reason to believe they will not. Even during a severe recession gas costs at least $3/gal across most of California, the threshold that once crossed in 2006 helped burst the housing bubble. Once growth resumes, whenever that might be, oil prices are widely expected to rise again, especially considering the steady increase in global demand. HSR is not the same as ongoing expenditures for health care or education. Like the Golden Gate Bridge or the Shasta Dam, it is a piece of infrastructure that enables economic activity to continue and grow well into the future. It enables health care and education spending to continue, rather than become strangled by gridlock. And yes, Eric Morris, HSR will help intracity transportation just as it will provide intercity transportation. In California HSR will be used by commuters within regions just as it will be used by commuters between regions. The HSR route will serve as a transit spine for the state, with its key nodes (SF Transbay, SJ Diridon, LA Union Station) becoming the centerpieces of local rail. HSR is a rising tide that lifts all transportation boats. Unfortunately, Morris is so in thrall to Randall O'Toole's anti-rail jihad that he won't stop to consider these aspects. Instead he uses the same arbitrarily limited and therefore insufficient scope to mislead readers about the true costs of projects. The Golden Gate Bridge might not have penciled out in the first 5 years from its opening in 1937, but hardly anyone today would argue the Bay Area is better off without it. 30 years from now, when Californians travel around their state on high speed trains, they too will wonder why anyone thought building it was anything but a sensible and farsighted idea. A third possible benefit of rail is environmental. Can high-speed rail bring people closer to city centers and thereby reduce carbon emissions? My work with Matthew Kahn on the greenness of cities suggests that each household that moves from Houston suburbs to the central city reduces carbon emissions and creates $164 of global-warming-related benefits each year. Each household that switches from suburb to city in Dallas creates $133 of benefits annually. Those benefits represent both reduced electricity usage (associated with smaller urban homes) and reduced driving. But there is little evidence documenting that rail has strong positive effects on land use. Glaeser, however, doesn't actually explain this supposed lack of evidence. His examples, MARTA in Atlanta and BART here in California, are limited. Glaeser says BART has had some positive effect on density, but "the effects are still modest." What Glaeser doesn't understand is that the Bay Area has a series of anti-density zoning rules in the most dense and favorable areas near BART stations - as anyone who's witnessed the battles in Berkeley over downtown development can tell you. Without those restrictions we might well have seen much more TOD along the BART corridor. Philadelphia is the more natural beneficiary of high-speed rail access to Manhattan; there are already people who live in Philadelphia and commute to New York. Yet even in this most propitious setting, the coming of Acela seems to have had little impact on the population decline of Philadelphia or growth of Wilmington. Perhaps the absence of any trend break in population growth around 2000 just reflects the incremental nature of the Acela investment, but there is little here to bring confidence that rail lines revitalize cities. Meanwhile, the blithe use of population change in Philadelphia as a proxy for economic benefit is a little silly. For one thing, it would seem to ignore actual trends. Since 2000, the rate of population decline in the city of Philadelphia has sharply diminished. From 2000 to 2001, the city's population declined by 15,000. From 2003 to 2004, by contrast, population fell by just over 7,000. And from 2007 to 2008, Philadelphia lost a mere 1,200 people. Just using Glaeser's fly-by-night statistical methods, it seems as though the introduction of the Acela has in fact materially slowed population decline in Philadelphia. And obviously there are other variables which show that Philadelphia has enjoyed a serious economic rebound over the last decade. Glaeser seems to believe that in coming decades congestion costs will cease rising; otherwise he'd build future increases into his model. He seems to think that the addition of over 100 million new Americans need not lead to any new infrastructure investment; otherwise he'd compare the economic benefits and life-cycle emissions of rail investments to alternative investment plans. I think those beliefs are daft and indefensible. And four posts into his high-speed rail series, Glaeser hasn't given any of us reason to think that his analysis is worth taking seriously. And that is the core problem with Glaeser's approach. He didn't consider the alternative costs, including the cost of doing nothing. He did not assess the benefits of the jobs HSR will create, or the role of the trains in creating new transportation patterns that can enable new kinds of economic growth over many decades. Glaeser's posts consistently and arbitrarily used a set of factors that gave readers a limited and incomplete sense of how HSR will actually play out in context. It would be nice if the NYT would give space to someone like Ryan Avent who can explain the benefits of HSR with respect to the evidence. Apparently that's too much to ask. That is a function of two basic factors. The first is that I simply don't have as much time to do HSR research as I did in 2008. While I'd like to have had time to develop a new platform for the blog, do some original research, and generate more original discussions, that time simply hasn't existed for me. That's the story of work in 2009 - one is either overwhelmed with it or has none and is desperate to get it. So I remain dependent on other news sources to generate posts here at the blog, with occasional help from folks who send in tips and story ideas (and thanks to you who do that!). Some of this is due to the ingrown bias of the media in this state. Having become familiar with NIMBYism over the decades, they are willing to make it sound as if the only thing that is newsworthy about the HSR project is the folks on the Peninsula who are flipping out about it. Don't get me wrong - those NIMBYs do have very real power. They represent, alongside State Senator Alan Lowenthal, one of the primary threats to the project's viability. They have the money, skills, and tactics needed to block the project. Kopp concluded his essay in a conciliatory tone, noting that engineering and design solutions are "achievable and can be adopted here at home to preserve the character and healthy environment of our communities while supplying California with a sustainable transportation alternative to gridlock." Let's hope he's right. There is no area of the Golden State with more at stake than this one. It's that last line which I find so stunning. There are plenty of areas of California with more at stake than the Peninsula. The Transbay Terminal is a key element of downtown San Francisco's transportation plans. San Jose will experience significant new growth - of the desirable centrally located urban in-fill sort. Southern California will have a revolutionized transportation network that will help ease congestion and fuel the growth of more mass transit options. But if you want to find a part of the state with more at stake than any other when it comes to high speed rail, you need to look not amidst the wealth of the Peninsula. You need to look in the Central Valley. Merced, Fresno, and Bakersfield will be utterly transformed by high speed rail. Cities that are struggling with some of the state's highest unemployment rates and some of the world's highest foreclosure rates will have the opportunity to enjoy major and sustained economic growth. HSR will take these cities, currently and unfairly seen as backwaters in a state focused on the two coastal megalopolises, and give them the chance to participate in the 21st century economy. Fresno and Bakersfield will be less than 2 hours away from downtown SF and downtown LA. That's a reasonable commute time, meaning workers in the SF and LA areas can afford to live in the Central Valley, where housing is currently quite affordable. That will in turn bring new jobs and other opportunities to those cities that at present lack other options. Ultimately, of course, it is the state as a whole that has an enormous amount at stake with the HSR project. It is essential to our future economic security, our energy independence, our strategies to reduce pollution and address global warming, and to our efforts to seed and support urban infill density that we build the high speed rail project as laid out in the voter-approved Proposition 1A. Squeaky wheels may get all the attention, but it should not lead us to ignore the rest of the train. The crown jewel of Innovation Place is a complete transformation of the University Avenue station area, as envisioned in the team's graphic above. High speed rail or not, this area of Palo Alto is in dire need of a redesign; today, access between three important zones of activity (the University Avenue shopping district, Stanford University, and the Stanford Shopping Center) is a circuitous and dysfunctional jumble that is both unpleasant and time consuming to navigate, whether by foot, bike, car or bus. Neighboring areas just a few hundred feet apart feel miles away from each other. The remainder of the Innovation Place proposal consists of a 31-acre linear park adjoining Alma Street, featuring a bike and pedestrian path and reuniting the two halves of Palo Alto formerly separated by the train tracks. The additional cost of putting the tracks underground would be financed by selling $700 million worth of air rights for development. Go over to Clem's blog to read the full details and see some very intriguing designs, along with Clem's thoughts on the concept's strengths and weaknesses. Personally I think this is exactly the kind of work that Palo Alto residents ought to be producing. Rather than trying to say "no" to the HSR/Caltrain project, the thinkers behind Innovation Place have said "yes" to integrating it into their community. It would be wonderful if Menlo Park and Atherton chose to follow this model instead of wasting taxpayer money on a lawsuit that is doomed to fail. As to the concept (which should not be described as a "proposal" at this point since it isn't at that level of specificity), I like it. There's the question of the possible roller-coaster effect of a high speed train entering a tunnel for Palo Alto only, and whether $700 million is enough to underground the route. It's also unclear whether Union Pacific will go along with this, as it would pretty much eliminate their ability to continue freight operations over that section of track (although they could theoretically revive the Dumbarton corridor and use the shared tracks along the rest of the HSR/Caltrain corridor north to SF). But this is absolutely something worth exploring. What's Up At The New York Times? The New York Times has now turned loose writers at two of its economics blogs to make weak arguments against the construction of high-speed rail lines. I have been following Ed Glaeser's attempt to do a back-of-the-envelope assessment of the costs and benefits of a hypothetical rail line (catch up here and here). Now, Freakonomics' Eric Morris seems to want to get in on the act, via a lame post comparing the effects of high-speed rail with the fruits of "cash for clunkers." Let me just begin by pointing out how utterly ridiculous this comparison is. The Obama administration's vision for high-speed rail essentially involves a multi-decade effort to significantly upgrade transportation infrastructure along several of the country's most economically important metropolitan corridors. "Cash for clunkers," on the other hand, is a $3 billion, roughly two-month program of automobile purchase incentives. Avent goes on to explain his quite sound reasoning as to why it is totally absurd to compare these two programs. "Cash for clunkers" is a program that is designed to produce immediate economic stimulus through the sales of a few thousand cars, offering the possibility of some extremely minor environmental benefits. HSR is a long-term restructuring of intercity and interregional passenger transportation, a permanent piece of infrastructure whose benefits will be with us for many decades to come - just as the Golden Gate Bridge and Shasta Dam are still providing us with economic activity 70 years later. Both programs are valuable, but for utterly different reasons. To compare them is to confuse them - and to confuse the reader. I'm led by this to believe that Morris does not actually understand how global warming works -- that it is due to the slow accumulation of greenhouse gases in the atmosphere over time. The only way we'll ever feel any greenhouse savings from any policy is over a considerable amount of time, which is why wonks discuss carbon reductions in terms of what we might be able to accomplish by 2020 or 2050. Does Morris think that next year will be cooler thanks to "cash for clunkers"? I certainly hope not. What Avent is identifying here is that these two economists, Glaeser and Morris, are not offering an assessment of the long-term needs of the US economy and transportation system. Economics as a field of study particularly suffers from a belief that acting on global warming is of less importance than providing economic growth. It's a false dichotomy - HSR is a perfect example of how one can do both at the same time - but it is what the New York Times has given its blogs over to promoting in recent weeks. American economic policy, and much of American economic thinking, have become dominated by near-term concerns. The next month, the next quarter, the next year. Maybe the next four years if you're lucky. Longer-term policy is rarely discussed in the economic press and while it may get some ink among academic economists, the writing we see many economists offer for public consumption treats long-term infrastructure spending as wasteful, unnecessary, or both. Hence the ingrown biases and flawed methodologies of both the Glaeser and Morris posts. HSR doesn't make sense in a short-term time frame. We all know that. Keynes may have noted that in the long run we're all dead, but many of us have quite a long way to continue running. It makes sense that we will want to secure sustainable economic prosperity and work to solve those broader forces that challenge that, such as global warming. For the last 30 years US economic policy has emphasized the short over the long, the next few years over the next few decades. Even though the New Deal provided the basis for long-term growth and unprecedented national prosperity, that kind of big-picture economic policy work has been eschewed for a debate over how to best float the next asset bubble. 30 years of short-term fixes and neglect of the long-term strategy has produced a series of ever greater bubbles and successively more catastrophic results of that bubble's inevitable burst. This exercise is, as best I can tell, an effort to show that investments in high-speed rail are not worthwhile, from an economic or environmental standpoint, based on extremely pared down models and faulty assumptions, with the goal of influencing how their readers view the high-speed rail initiative. It's simply irresponsible. Times readers deserve to be better informed. I have no idea why the Times has chosen to not provide better information to its readers. But that is what they have done. As we in California know, this is par for the course. In 2008 reporters frequently repeated the largely baseless criticisms of HSR and ignored or downplayed its more proven benefits. They share the right's skepticism of government programs, and while we all want government to be closely watchdogged - including those governments involved with the HSR project - there's a difference between honest oversight and a stacked deck. The New York Times, when it comes to HSR, is playing with a stacked deck. But at least we in the blogs know how to identify which are the marked cards. This post is about an ambitious idea I had for a new regional light rail/streetcar line between downtown San Francisco and San Rafael in Marin County. While the primary purpose would be local and regional transit for residents of Marin county, it would also connect both them and Sonoma county residents (via connection to SMART) to high speed rail at the future Transbay Terminal Center. Early in the 20th century, the only way to cross the Golden Gate Strait was with a ferry from piers along the SF Embarcadero to either Sausalito or Tiburon. From there, a standard and a separate narrow gauge railroad provided connecting passenger service to points north. When the Golden Gate suspension bridge was designed to accelerate transit, the plan was to support streetcar service on two of its lanes. However, the actual construction never featured any rails because there was never anything to connect them to at either end. By the late thirties, transit agencies were switching to diesel buses which were more flexible and cheaper to operate. That is still the case today, but bus ridership suffered greatly once just about everyone could afford cars of his or her own. For a variety of reasons, electric trains - especially grade-separated subways - tend to be more popular with commuters. The principal problems the popularity of private cars created for urban planners are road congestion and land use for parking spaces. Congestion also impedes bus and streetcar operations. Air quality issues related to gasoline cars have receded thanks to three-way catalysts. Comparable technology for diesel engines is much more expensive and was not even available in California before late 2008. In a rare example of prescient regional transportation planning, an Army-Navy board convened after WW2 recommended the construction of a fully grade separated electric rail network spanning San Francisco, San Mateo, Marin, Alameda and Costra Contra counties. Since only the lower deck of the western span of the Bay Bridge had been constructed to support trolley service from the East Bay to the SF Transbay Terminal, the whole bridge was to be given over to motor vehicles. The new trains would run out to Daly City in a subway under Market Street, with a fancy new transbay tube across the Bay. Soon after, this plan became the basis for the civilian BART organization. San Mateo soon bowed out, citing the high cost of full grade separation required to enable third rail operations. In addition, Standard Pacific already provided diesel-based passenger rail service into San Francisco. Keep in mind that at time, this was profitable, the peninsula was sparsely populated and no-one had even conceived of Silicon Valley. BART engineers had picked 1676mm broad gauge for the new network, in part to provide mor stability for the planned Marin line across the Golden Gate bridge. Marin county withdrew from BART regardless. The primary reason was its limited tax base, but there was also some renewed discussion of whether the Golden Gate bridge could support the BART trains, which are longer than streetcars (though lighter per unit length, which matters more for bridge safety). Up to a point, the engineering discussion may have been a bureaucratic smoke screen: the Golden Gate Transit Authority was jealously guarding its turf, which included the bridge and toll collection on it. Marin county did spend quite a bit of time and money on studies related to the old railroad lines, whose fortunes had declined due to competition from US 101, increasing opposition to logging in old-growth temperate rainforests, tunnel fires and the high cost of maintaining the Eel River valley line up to Eureka. Certain sections are prone to flooding and/or geologically unstable. The county and its neighbor to the north, Sonoma, ended up purchasing the right of way between Corte Madera and Ignacio, just south of Novato Junction. Between Corte Madera and Sausalito, the old right of way is being preserved as a bike route called the North-South Greenway. Bicycles are serious business in Marin: millions are currently being spent on restoring the old railroad tunnels, something cyclists in Santa Cruz county can only dream of. Parts of the old line between Corte Madera and Tiburon are also being preserved as bike trails today. The section between Schellville Junction (south of Sonoma town), Novato Junction and Eureka was taken over by the North Coast Rail Authority (NCRA), a California state agency created specifically to keep the ROW from being abandoned. In 2006, it leased the right to operate to the resurrected Northwestern Pacific Railway (NWP). It intends to minimally rehabilitate the line - top speed 10mph in some sections - to support the extraction of aggregate from the Eel River valley. Tracks still exist between Schellville Junction and Fairfield Junction with the Capitol Corridor main line, though they will also need to be rehabilitated before they can be brought back into service. In retrospect, many North Bay residents now regret Marin's 1961 decision to withdraw from BART. The Golden Gate bridge is now badly congested during rush hour, tolls have since risen to $6 southbound and all-day parking in SF has also become very expensive. In 2008, a 2/3 majority of combined Marin and Sonoma county voters approved a sales tax hike to fund the resumption of passenger rail service between Cloverdale and the Larkspur ferry terminal under the name SMART (Sonoma-Marin Train). To preserve the option of double-tracking at some point in the future, a bike trail will run next to the restored line. Detractors rightly point out that that any future service to Sacramento and Oakland is just a pious hope at this point. For the moment at least, Marin county in particular is heavily dependent on its tenuous connections to San Francisco and Berkeley. There is also concern that NWP's plan to support controversial mining operations in Mendocino county will lead to numerous heavy freight trains running through multiple Sonoma county towns at night, just to avoid conflicts with SMART's timetable during the day. NWP has already begun with rehabilitation work, so SMART may be forced to select FRA-compliant equipment such as DMUs from Colorado Railcar, which had briefly gone out of business in 2008. Choosing FRA-compliant equipment would essentially kill whatever hint of a sliver of a chance there remains of ever laying heavy rail tracks south to Marin City, never mind Sausalito. Tracks across the Golden Gate and into downtown San Francisco seem even more outlandish. Still, it's worth re-iterating that the Golden Gate bridge is badly congested, a situation that is unlikely to improve by itself anytime soon, if ever. FasTrak toll collection has certainly helped speed things along, but there are still plenty of people who prefer to pay cash. Restricting two lanes on 101 between San Rafael and the Marina district in SF to HOV vehicles would obviously increase throughput capacity, but it would also make commuting even more hellish for anyone who cannot - or will not - carpool. Private livery service is expensive and public buses not terribly popular. One possible approach would be to forget about the Larkspur Ferry and terminate SMART in San Rafael instead. There, passengers would make a cross-platform transfer to a new light rail service which I've dubbed the "Golden Gate Mariner". Provided cyclists agree to share the ROW as they already have for SMART, light rail should be compatible with current land use patterns in southern Marin county. The one significant caveat is that the old level railroad bridge across the Larkspur slough should be replaced. For a transit service that will run multiple times per hour, any swing or bascule section represents a risk to the timetable. The replacement should provide as much clearance as the adjacent freeway bridge. Fortunately, suitable light rail vehicles can handle grades as steep as 6%. OPTION #1 is to climb up to the Golden Gate bridge, run across that into the Presidio and head for the Marina District via Chrissy Field. Beyond that, trains could continue past Fort Mason to join up with the F-Market streetcar tracks along the Embarcadero, possibly hooking a left at 1st & Market to reach the new Transbay Terminal Center and looping back via Fremont Street. The big plus of this option is that it avoids seriously breaking the bank by leveraging the existing Golden Gate bridge. It would not be necessary to dedicate lanes to streetcar service, only to ensure sufficient space in front of and behind the heavy light rail vehicle to avoid collisions and exceeding local load limits. In practical terms, that would not be easy to do. Railroads use block signaling, perhaps something comparable (but with very short blocks) could be used in this context. The streetcar lane could be monitored with video cameras, anyone running a red light would be fined. This highlights the primary downside: sharing the existing bridge without dedicating one or two lanes to trains means inconveniencing motorists, even a potential safety hazard. Theoretically, light rail service would take more than enough cars off the bridge to compensate for the inconvenience. In practice, however, vehicle traffic volume tends to rebound before long as the population grows. The other downside is that light rail is limited to low speeds in streetcar mode. The total distance for option #1 is only 20.8 miles, but it could take an hour to cover that distance. OPTION #2 avoids the Golden Gate bridge, relying instead on a brand-new, dead straight tunnel under the Golden Gate between downtown Sausalito and Columbus Ave in SF. At 5.5mi, this isn't the shortest option for a bay crossing, but it does run along a ridge on the sea floor, this limiting how deep the tunnel would need to run. The line would continue up Columbus Street in SF and joining up with the northern end of the Central Subway. Sharing track with that would require schedule integration, as SF Muni currently plans to run the Central Subway at 5 minute intervals during rush hour. If sharing is possible, the GG Mariner would connect to BART / SF Muni at Powell Street and to Caltrain at 4th & King/Townsend. It would be possible to terminate the line at 3rd & Channel in Mission Bay. However, it would be useful to offer direct service to the TTC. Given that the complex vertical alignment of the Central Subway (option 3B per FTA's ROD), the only way to achieve that is with some new streetcar tracks to double back. The earliest opportunity would be Bryant Street just south of the portal, but it's a one-way street. It might make more sense to use SF Muni's existing tracks along King and Embarcadero, run past the ballpark and up 2nd (above the DTX tunnel). The line would end in a single-track loop via Natoma, 1st and Howard. Still, single biggest advantage of option #2 would be the shorter distance and much straighter alignment into downtown SF and out to 4th & King. Line haul time from San Rafael could probably be reduced from an hour to less than 40 minutes. That would be a game changer in terms of modal market share among commuters. Compared to that, the awkward detour to get to the TTC is a small price to pay. In addition, option #2 would create a second fixed link across the GG strait, a very useful thing to have in case the Bridge or US-101 ever became unavailable for an extended period of time, e.g. after an earthquake. The biggest downside, obviously, would be the fairly stupendous cost of constructing a bored tunnel under the Bay. The distance is much shorter than the one between England and France, but the ridership potential is also much smaller. There just aren't that many people in Marin county (or even Marin + Sonoma counties). A submerged floating tunnel, anyhow just a theoretical concept, is probably out of the question due to the high tidal currents in the Golden Gate. Perhaps a conventional immersed tube might be viable, as long as it is buried deep enough to avoid undesirable interactions with the currents. Since both options require a certain amount of streetcar service and would share some track and stations with SF Muni lines, the trains cannot be too long. Regional light rail lines of similar length with sections of mixed traffic with local streetcars operate successfully in Europe, e.g. the WLB between Baden and Vienna, Austria. Their dual track line is 30.4km (19mi) long with a total of 34 stops, roughly comparable to option #1 above. WLB has run on overhead catenaries for over a century and serves 30,000 passengers a day at intervals of 7.5-30 minutes (varies by day, time of day and location). That corresponds to a modal share of ~40% of commuters, even though there is no single traffic choke point comparable to the Golden Gate bridge. Ticketing is integrated with the zone system used by the regional transit authority VOR. WLB's new type 400 rolling stock is a custom low floor variant of Bombardier's Flexity Swift light rail product line. Each car is 27m long, doubly articulated, weighs 49 metric tonnes fully loaded and offers around 70 seats plus room for well over 100 standees. Typical trains feature 2 cars back-to-back, with the driver cabs at the free ends. For reference, WLB also operates some light freight trains on its own heavy rail tracks south of Schedifkaplatz and those of other railways. Note that overhead catenaries and conductor rails (for low tunnels) are expensive but don't require full grade separation. For option #2, OCS is the only way to go. Option #1 could be theoretically implemented with a clean diesel powertrain as well, since the only tunnel is the short one in Mill Valley. Also, any proposal to add sturdy OCS poles and wire to the iconic GG bridge might well run into environmental objections. Since most of the morning ridership on the GG Mariner would be southbound, it might be acceptable to make do with a single yard for overnight parking. The easiest location for that would be at the end of a short spur in Corte Madera, see map above. The location used to be part of the NWP line to Tiburon. The last trains of the day would dead-head there from San Rafael.